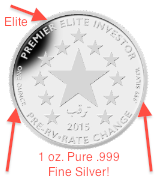 Complete Your 2 Coin Set and Upgrade to this .999 Pure Fine Silver Premier Elite Investor Coin Absolutely FREE! 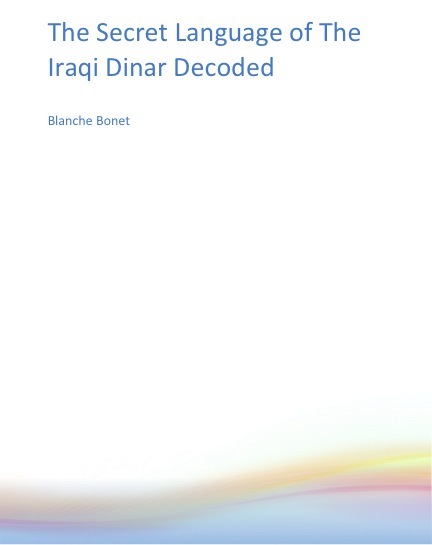 Attention: Dinar Guru Community Members And Dinar investors…Deadline is 12 midnight, Wednesday September 9, 2015 ** Small extension because of Labor Day postal holiday **. You get 6.3 dinar for every 1 Syrian pound! That's over 6 times the value! The smell of rot, decay and mold was unbearable…even a commercial grade face mask couldn’t keep the stench out of my nose. Flooding, tornadoes, fires, near riots…the entire gulf coast was beyond a mess. This is your Dinar information lifeline…PRE and (especially important) POST RV/rate change information. Even at only $37/month I know you may still be a little nervous. So here’s the thing I like to do with everything I offer. Also, I can’t keep it at this secret for long…this is the last time you will see this before everyone sees it. PS Remember you're getting Dinar Guru Insider PLUS the .999 pure sliver Premier Elite Investor Coin, the "You Knew Back When" Award Certificate, The Secret Language of the Dinar Decoded Special Report, The LOP vs RV Special Report...and once the dinar makes a significant rate change you'll get the Post RV/Rate Change Cheat Sheet and preferred access to the special limited edition Post RV Minted Coin too all for only $37/month! This is 100% guaranteed too...if you're not happy I'll refund your money right away no questions asked and you keep everything. Click below to get started now. No thanks Blanche, I want to revoke this and downgrade my membership…I understand my Dinar Guru Insider Membership spot and silver coin will be given to someone else in line. Congratulations on getting the brass coin! Now I’m going to show you how to complete your two coin set and get this awesome .999 pure fine silver commemorative pre-RV collector's coin for free! You can't purchase an Uncirculated Premier Elite Investor silver anywhere and when this year ends, the 2015 Dinar Guru Elite Investor coin will likely never be minted again. But now, while there's still time (Deadline is Friday July 17, 2015), you can get this 2015 pure silver coin FREE! I'll show you how. Combined with your brass coin...owning this precious metal silver coin will complete your two coin set. 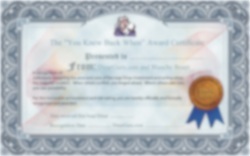 Because you are a dinarguru.com member who ordered the Premier Investor Brass coin and as a HUGE thank you, you’re hearing about this before most anyone else (this sneak peek ends on Friday July 17, 2015!). The beautiful and sought-after Premier Elite coin is over 99.9% pure silver and was designed by an award winning, world renown coin designer who has designed currency coinage for countries around the world! This is a unique and poignant way to commemorate and remember your dinar experience. Long after all your dinar have been exchanged, you and your family will always have this precious metal coin that tells your dinar story and proves you were here BEFORE everyone else even knew what dinars were! Everyone wants one but not everyone can have one. Obviously, you take your dinar holdings very seriously...your actions on being a Dinar Guru member and getting the brass coin prove this. 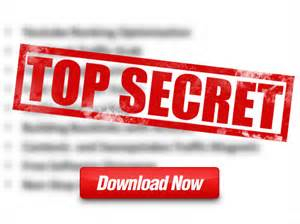 You are an Elite investor and because of this I have something VERY SPECIAL that will separate you from the crowd. Look at this beautiful coin...do you spot the difference between this silver coin and your brass coin? Precious metal: This is 1 oz of .999 pure fine silver. It will ALWAYS have value. $97 value...yours free: This coin has a value of $97 but is free for Dinar Guru Insider subscribers! Made in USA: From design to sculpting, to striking, to minting…all U.S made. Premier ELITE Investor Coin: You are one of the first to invest, so you will be one of the first to own one of these rare and valuable collectors items! Commemorative Pre-RV- Rate Change Coin: This is your tangible proof you can hold in your hand and share with family and friends for years to come, that you knew about the possible RV before most were willing to take the risk! Individually Numbered: Each coin is INDIVIDUALLY etch numbered starting with coin #1making each coin a UNIQUE piece. Extremely Rare: A very limited number of these silver coins will ever be minted. Once they're gone they're gone. 2 coin set: You already have the Brass Goldine coin...very few will have the complete 2 coin silver and brass set you'll own. Each coin is individually numbered so you'll know exactly which coin is yours and what order you're in...the earlier you order the lower numbered coin you will receive! This is a pre-RV/rate change coin...by owning this coin you record you place in history. You want it...right? So does everyone else. But it's NOT sold anywhere and when it is offered it normally sell for nearly $100. But guess what? There is only a few of these coins in existence and I've got one waiting for you. All you have to do is claim yours. When I started Dinar Guru I had no idea it would grow to nearly 100,000 members, become the largest community of dinar holders on earth and have the only PRINTED newsletter in the world dedicated to the dinar investors...I just wanted to help people understand this investment better. 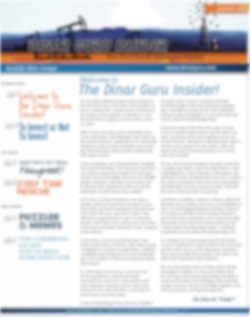 Every month Dinar Guru Insider members learn more and more about the dinar and how it fits into the larger picture. Dinar Guru Insider members are constantly learning why this investment is right for them. It provides the fortitude and clarity dinar holders need to understand the pre-RV/rate-change landscape and maybe even more importantly, gives the insights and inside information members need for POST rv/rate-change exchange. I am very proud of what we, the members of dinar guru, have done and what we will do in the future as this all unfolds. Today, we the members of Dinar Guru Insider, want to give you the beautiful Premier Elite Investor Coin I showed you earlier as our personal gift that welcomes you to our family. Just hit the button below and we'll get this coin to you absolutely free. 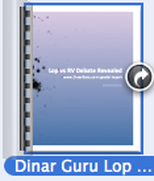 You'll also get Dinar Guru Insider membership...this is our exclusive premier level membership. As a Dinar Guru Insider (DGI) member you will receive a ton! “Blanche, I just received Dinar Guru Coin. LOL, it even came to the right address. I just wanted to let you know how unique and lovely it is. I guess I didn't think that it would be of that quality. Thank you for the newsletters and I look forward to the arrival of the 2nd coin.”-C. S.
Get the Insider, the silver coin, the Post RV Exchange Bonus and other bonuses before it's too late. We only have 50 available. Many silver coins have already been claimed. When there gone they're gone. Last time I offered the Premier Elite Silver Coins they were all claimed in less than 2 days! 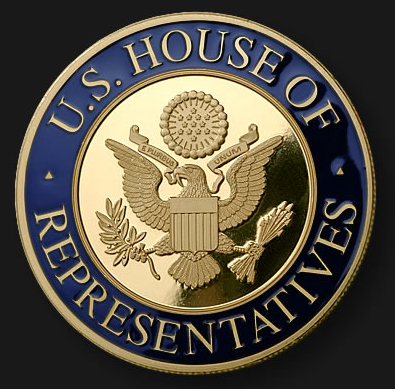 IMPORTANT: An EXTREMELY limited number of these coins will ever be minted…you will own the complete 2 coin set! Only you and your fellow Dinar Guru Insider members can say this.